When it comes to daily dressing for your baby, you will probably want to consider outfits that are uncomplicated and easy. Soft and comfortable basics for your baby is the key ingredient for casual outfits or easy daily wear. With our Infants V Neck T-Shirt for babies, it features a classic v neckline thats not too tight around the neck for an easy over-the-head dressing. Made for soft delicate skin, this infant's v neck t-shirt is super-soft to the touch and hassle-free. Not only is it available for infants but we also carry this popular basic v neck for toddlers as well! 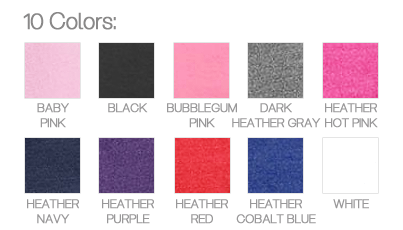 Now available in a spectrum of 10 popular colors consisting of super-soft heathers and solids, in Infant Sizes 6M-24M and Toddler Sizes 2T-5T.